The Basement Boys are back! There are comics, trailers, and movies to talk about! Zan and Jayna get a new start in Wonder Twins. Marvel launches its second Conan book, and Dynamite has another first issue for Red Sonja. Elsa, Anna, and Kristoff are back in the Frozen II trailer. Nicholas Hoult brings JRR Tolkien's very own story to the big screen. Happy St.Patty's Day everybody! Pete's got his Green Lantern shirt on, his beer is poured, and he and Ramon are ready to review some books! Find out just why Al Simmons is back as Spawn in Resurrection. What the hell is the Joker up to in Endgame?? Green Lantern Corps and Magnus: Robot Fighter draw o a close. Where can a guy get a decent custom action figure of himself? And who would win in a fight: Dr.Doom or Darth Vader?? All this and more, on the next episode of Pete's Basement! Start your downloads, folks! It's Star Trek, the final frontier. Stuart Moore and J.K. Woodward, writer and artist on IDW's Star Trek Captain's Log: Pike, drop in and force Pete to boldly go where he has never gone before! 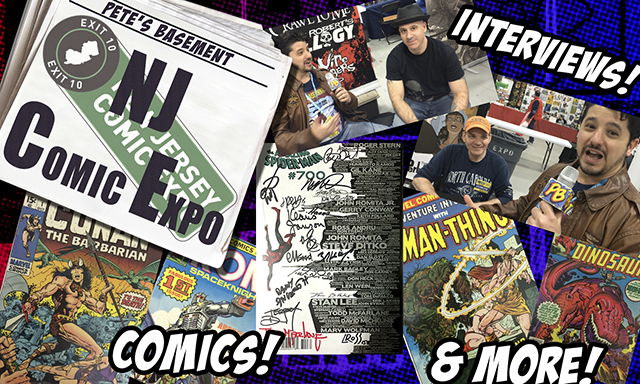 Plus -- new basement smell, and signed Trek comics to win!